With Father’s Day coming up in just three short days, I knew I had to come up with a creative gift idea, and fast. My husband is a music lover—he always listens to tunes when he’s at work, but I know that his headphones are just thrown to the side of his desk when he’s not using them. He’s a software engineer, and his space is already cluttered with computers and papers and phones (oh my! ), so I decided to create a simple solution for headphones storage. Bonus points for making it pretty, accenting with gold and creating a space for our daughter to leave him little notes when we visit him at the office. First things first. The wood plaque might have a few rough spots, especially around the edges, so give it a once-over with high grit sandpaper. I used 120 grit because that’s what I found in our work room, but if I didn’t have that, I would have preferred 180 grit to get a smoother finish. Use your ruler to measure where you’d like to attach the wooden doll to the plaque, and mark the spot with a pencil. Then, using a drill bit that coordinates with the size of your screw, drill a hole all the way through the plaque (front to back) and another into the back of the wooden doll. Paint the front of the plaque and the body of the wooden doll with chalkboard paint. I used a foam brush to get a smooth finish and did three coats, waiting for each one to dry thoroughly before applying the next. Using a soft bristle brush, paint the edges of the plaque and the head of the wooden doll with the liquid gilding. Because the consistency is very thin, apply it sparingly to avoid drips. Make sure to open a window and do this step when the littles are napping or out of the house because the fumes are pretty strong. Using a Phillip’s head bit on your drill (or just a Phillip’s head screwdriver), attach the wooden doll to the plaque by screwing them together from the back. It might take a little bit of adjustment to get them aligned just right, so be patient! I wanted to add a pop of color to my headphones hanger, and my original plan was to paint a stripe across the plaque. But after seeing how sleek the black and gold looked, I decided to go for more subtle pop and added a band around the wooden doll right below the head. If you have a steadier hand than I do, you could do this free hand, but I used painter’s tape to ensure that I’d get a crisp line. Don’t forget to remove the painter’s tape before the paint dries! 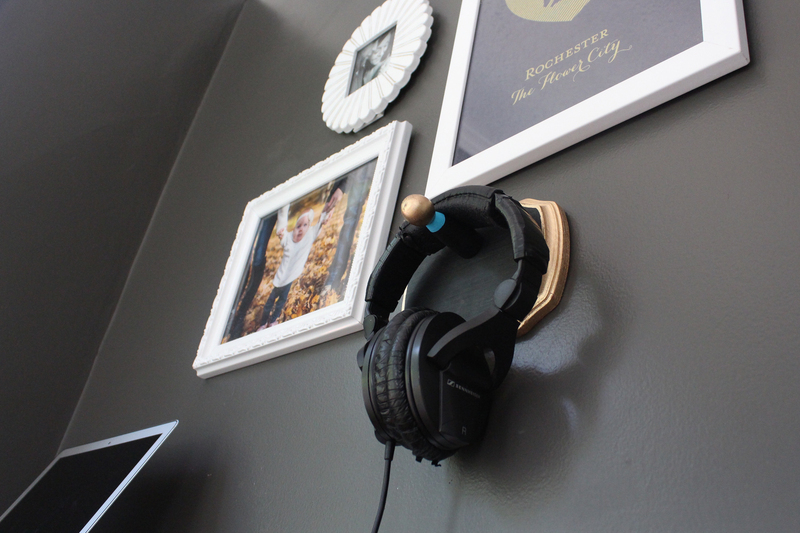 Once the accent color dries, you’re ready to hang your headphones hanger and put it to the test! I can’t wait to give this to my husband to add a little much-needed organization to his office. Wishing you and all of the husbands, fathers and grandfathers out there a very happy Father’s Day!